Japan's Prime Minister Shinzo Abe waves to the crowds at the women's preliminary round ice hockey match between Japan and Sweden during the Pyeongchang 2018 Winter Olympic Games on February 10, 2018. Japan – along with South Korea – is a key ally of the United States (US) in the region and plays a major role in the US’ plans of minimising Chinese influence in the Indo-Pacific region. Meanwhile, China are working hard to realise their Belt and Road Initiative projects. According to a PwC report from 2017, the BRI project is expected to cost almost a trillion US dollars and involves over 65 nations. While the BRI project is largely an infrastructure one, analysts like Peter Cai of the Lowry Institute have been quick to point out that this project is clearly in line with Chinese geopolitical ambitions. Developing regions such as Africa and Southeast Asia are the two main regions where both, China and Japan have been trying to gain as much influence as possible. Southeast Asia at the moment is particularly attractive to both countries due to it’s large market of over 600 million people, a rising middle class and a booming digital economy. Aside from that, analysts such as McKinsey & Co. director, Dr Jonathan Woetzel, are saying that Southeast Asia is currently facing a boom in infrastructure development. At the moment, Japan is leading the race in Southeast Asia, having made a total of US$230 billion worth of investments in the region dating back to the early 2000’s. 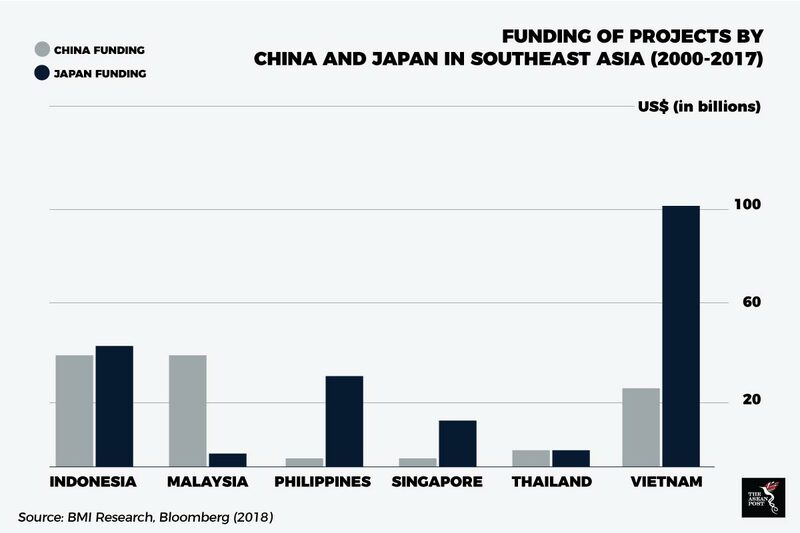 According to a 2016 DBS report, at the time, Japan’s total investments in the “ASEAN-6” – Singapore, Malaysia, Thailand, Indonesia, Philippines and Vietnam – accounted for more than 50% of their total investments in the region. Citing BMI Research, a Bloomberg report earlier this month shows that Japanese backed projects in the region total up to 237 as opposed to 191 Chinese backed projects in the region. According to a report by The Diplomat in 2017, Japan has found a new strategic partner in the Philippines. Last year, Japanese Prime Minister, Shinzo Abe announced a five-year, US$8.66 billion aid package, which consists of both, private and public-sector funding. Despite large Japanese investments in the region, don’t be so quick to write off China. The fact that China is catching up to Japan in the region is impressive considering their late entrance into the game. Christian Zhang, an infrastructure analyst at BMI Research told Bloomberg, “While Japanese companies and government agencies have had a long head start, Chinese companies have key advantages that could see them overtaking Japan in specific sectors.” With the BRI underway, expect Chinese investments and trade in the region to grow. Malaysia is one of the countries reaping the benefits of Chinese investments in the region. According to a Bloomberg article this month, China has backed 30 projects in the country. The East Coast Rail Link from Kuala Lumpur to Tumpat is the biggest project they’ve backed there, with Exim Bank of China pledging US$14 billion dollars according to Nikkei Asian Review in August 2017. Competition between Japan and China is also fierce in other parts of the world. China and Japan are looking to make inroads into the African continent. Just last week, the Africa Development Fund (ADF) released a statement that the Japan International Cooperation Agency (JICA) have agreed to provide an Official Development Assistance loan worth about US$700 million to the ADF. Aside from that, Japan is also collaborating with India and some African governments to establish the Asia-Africa Growth Corridor or AAGC. The AAGC project will revolve around a maritime corridor that will link Africa with Asia. Analysts have already pointed out the similarities between the AAGC and the BRI. “It is quite apparent that the Asia-Africa Growth Corridor is Tokyo’s alternative to the One Belt, One Road Initiative,” said Harry Sa, a senior analyst at the S. Rajaratnam School of International Studies (RSIS). Conversely, the Washington Post reported in 2016 that Chinese President, Xi Jinping has already pledged US$60 billion in investments to Africa. Moreover, the China Africa Research Initiative at Johns Hopkins School of Advanced International Studies revealed in 2017 that trade between China and Africa has increased 20-fold in the past 15 years. As investments in the region grow, Southeast Asia can use their centrality to take advantage of the situation. For example, the Nikkei Asian Review reported in January 2018 that in the run up to the development of the country’s first high-speed railway, Indonesia ditched their plans to adopt the Japanese Shinkansen bullet-trains that came with loans and instead went for the Chinese bid for the project which came without loans. As long as Southeast Asian countries are smart enough to take advantage of the current Japan-China tussle for influence, the scenario could be seen as a golden opportunity for the region. However, when issues such as the South China Sea islands dispute come about, ASEAN countries may find the spill over effects not so pleasant to deal with.